Looking for something sweet that is home made and yet gourmet? Want to impress your guests? Just do this! Here's an easy recipe with very few ingredients and extra delicious, especially for chocolate lovers! Don't be afraid to give it a try. Keep in the fridge and indulge yourself. In a mixing bowl add coconut milk, sugar, and coconut flakes. Mix well. Take the smallest size ice cream scooper and press tight to create mini bounty balls. Place on the baking sheet and refrigerate for half an hour. In the meantime melt the chocolate in a double boiler or in the microwave. Add vanilla extract, powder sugar, and vegetable oil. Mix well until you get very smooth consistency. 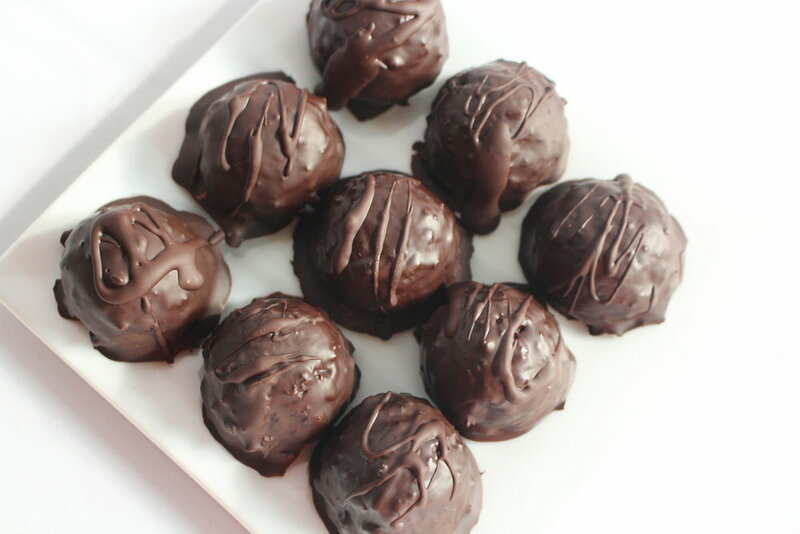 Use a fork to dip each coconut ball in the melted chocolate and place back in the baking sheet. Refrigerate for half an hour. Warm the leftover chocolate again, take a fork and drizzle little strip patterns on the top. Let it cool in the fridge for another half an hour. Store in a air tight container and keep in the refrigerator.